托尼·艾尔斯2015年导演的澳大利亚恐怖片电影《切蛇》又名:Cut Snake,由沙利文·斯特普尔顿,,杰西卡·德·古维,亚历克斯·罗素主演,Young, charismatic, and hardworking, Sparra Farrell (Alex Russell) seems to be sailing into a happy, respectable life. He has a solid job and an adorable fiancée named Paula (Jessica De Gouw), and already owns a modest house in the country outside Melbourne. The only odd thing is that Sparra says precious little about his past — but that past is about to catch up with him, and wrest control of his present. 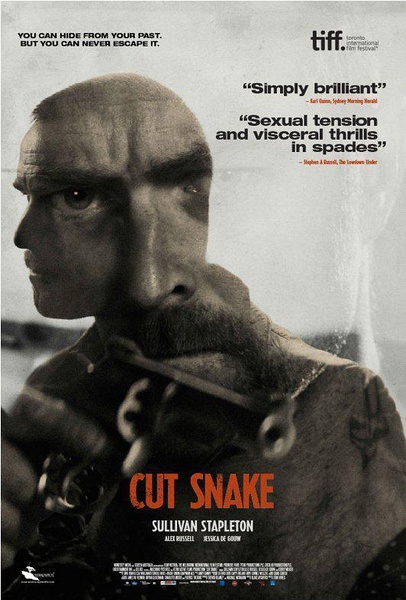 Set in 1973, Australian director Tony Ayres’s bold return to feature filmmaking is equal parts crime story and love story, an inspired variation on A History of Violence that considers aspects of criminal relations rarely explored onscreen. Sparra’s domestic idyll is ruptured when he and Paula receive an unexpected visit from Pommie (Animal Kingdom’s Sullivan Stapleton, who also appears at the Festival in Kill Me Three Times). Pommie knows Sparra’s most closely guarded secrets — including the stint he did in a Sydney prison — and expects him to make good on an old promise if he wants to keep those secrets safe. “You always knew there was something different about him,” Pommie tells Paula. “That something is me.” Working with a stellar cast and Blake Ayshford’s brilliantly structured script, Ayres plumbs the shadowy depths of his characters for the brutal truths that most thrillers only hint at. The result is an incendiary noir drama burning with fear, rage, desire, and irresistible impulses. Money will be stolen, blood shed, dreams shattered, but what’s left at the end of Cut Snake is a bond made only stronger by twin forces that should not be underestimated: self-knowledge and acceptance.